For those who don’t know, Scarlet Moon Records, the company behind the Prescription for Sleep series, just announced a new Celeste cover album that releases on November 2nd. Metal Gear Solid composer Norihiko Hibino (saxophone) is joined by Etrian Odyssey performer AYAKI (piano) for their seventh album together as GENTLE LOVE. Prescription for Sleep: Celeste also features guest violinist maiko and is co-produced by Celeste composer Lena Raine. 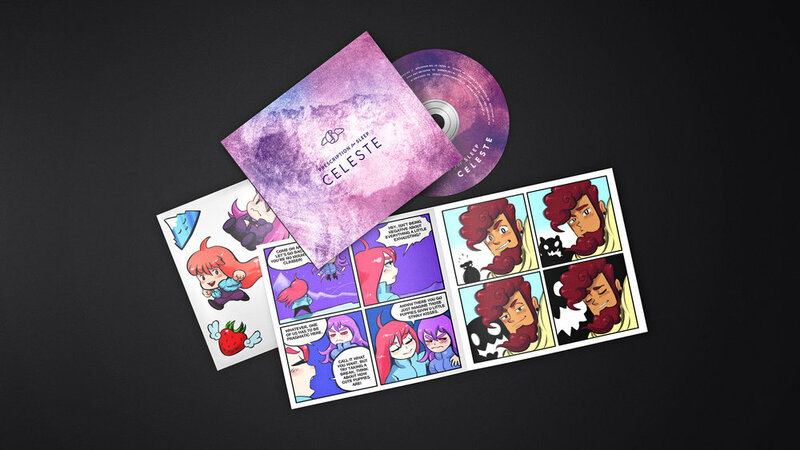 The album features 11 tracks from the Celeste OST, including one original composition by GENTLE LOVE. After previewing some of the album’s tracks, I felt compelled to reach out to Jayson Napolitano and Lena Raine, the album producers, to learn more about this arrangement album and the original Celeste OST. Thankfully, they accepted my interview request, and provided some interesting insight into the creation of this album as well as the video game music industry as a whole. Enjoy! What was your approach to creating the Celeste soundtrack? Did you have any specific inspirations for the music? Did Matt or Noel give you any ideas for the music? Lena: I originally approached the Celeste soundtrack with a bit more of a retro vibe than I ended up with. I absolutely knew I needed to write something catchy and memorable, so the main melody came first. While I didn't get the vibe right on my first attempt, I managed to rework the melody I'd come up with to become the main theme for Celeste, as well as the main character Madeline's own theme. Matt and Noel (the game’s developers) mostly gave me free reign and trusted me to write something true to myself and fitting for the game. While there was no strict guidance, they did help steer me towards where everything ended up. I think the biggest appeal of Celeste’s music is the entrancing nature of it. In other words, when you’re playing the game (and dying repeatedly), the music is there to comfort you, to keep you going when you feel like giving up. How did you accomplish this? Lena: When you're scoring a game, there are a lot of different ways to approach it. The older, retro style is to create a wallpaper of sound. Since older hardware could only really start a track and keep it looping, they didn't have much of an opportunity to score much more than a continual mood. Now, with all sorts of dynamic cues, a lot of games rely on smaller motifs and ambiance to prevent the music from sounding too repetitive. For a game that made so many nods to older titles, Celeste definitely needed to have an older, wallpaper approach to the music. The tricks that those older games used was to make as catchy a hook as possible and get a groove going. It got repetitive, but most people don't mind since the quality of the music was good enough to warrant that repetition. It's no small feat to write catchy music, but I got my start years and years ago by imitating the game music I grew up with. We have the benefit of hardware with larger memory and dynamic music, so in a lot of ways the music I wrote for Celeste is a natural extension of the platformer background music of years past. The main difference is now I can write longer tracks, make them change based on gameplay, introduce secondary sections, and use all the sorts of compositional tricks classical composers have used for years to create variations on a theme. But it all starts with that catchy motif or melody and expands from there. While I could talk at length about any track on the album, I want to discuss one in particular, “Resurrections”, which just so happens to be my favorite track in the game as well. During my first playthrough, I wasn’t quite hooked on the game until that one special moment in Old Site. What were you trying to convey with the music in this level? Lena: Resurrections is a track that reflects Madeline's journey through the stage far more closely than any other, and I think it's that arc that makes it appeal to so many people. It's like its own little story in and of itself. The music in the level “Resurrections” is from isn't dynamic, but it uses progressive cues to really tell a story out of the gameplay and exposition. It begins with a mystery. What's going on? Then the mystery escalates. Something weird happens, and the tension is elevated. I love seeing people react to the post-mirror music cue, because there's an almost universal surprise when I drop in the super laid-back breakbeat. Like, "wait you can do that in a game?" Catchy beats aren't uncommon in games, but I think that sort of sample-driven groove isn't something people are used to showing up in game scores. It's something I absolutely leaned into as I got further into the soundtrack. I used my own drums a lot, but (and especially in the tail end of Scattered and Lost) I threw in some really nasty beats to show that I meant business. The 3rd and 4th sections of the progression are a partial resolution of the tension, then the final escalation. The mysterious figure reveals herself, and we have Badeline's theme, which gets expanded later in “Little Goth”. Then, the chase. It was really interesting to score a chase sequence that, by contrast, feels super fast and frantic... But if you actually take the piece of music on its own, it's actually still pretty slow and laid-back tempo-wise. It's a bit of an example in how important it is to work within the context of the music that comes before. Judging from the B-sides album, you clearly support the cover and remix community. Did you pick those particular artists or did they reach out to you? Lena: Absolutely! I got the idea for the remixes from a number of my favorite game soundtracks getting remix albums after their release. Parasite Eve Remixes was one of the formative albums of my high school years, and actually introduced me to a number of electronic music styles I'd literally never delved into, especially as a kid that mostly listened to game soundtracks. Then, over the years, more of my favorite soundtracks would get official remix albums and arrangements. My favorite recent one was the NieR Tribute Album -echo-, which introduced me to even more artists, including World's End Girlfriend. In a lot of ways, I wanted to uphold the tradition of using official remix albums as a means to expand on the original music, but also help promote some of my favorite composers and artists. After getting the OK from Matt and Noel, I made a short list of artists that I looked up to, as well as either knew personally or had some means of contact with (this mostly meant that I was able to DM them on Twitter). Either way, nearly every single person I messaged was able to help out! It was a really amazing feeling on my part, since I felt like I hadn't earned the trust to just make a remix for an unreleased game. I gave each of them a particular area to remix that I felt spoke best to their own personal style, but beyond that I tried to return their trust and let them write something that felt personal to them. I'm extremely happy with what they came up with. How did the idea for Prescription for Sleep: Celeste come about? Lena, were you aware of Prescription for Sleep and GENTLE LOVE before this album? Jayson: I heard about how great the soundtrack was on social media and ended up listening to it and buying it on Bandcamp. That eventually resulted in my buying and playing through the game. I was already thinking it would be a neat idea to do Celeste for our next volume given that our UNDERTALE album was hugely successful, and so I reached out to Lena ahead of GDC 2018 to ask if she’d care to meet up. She agreed, and I made it a point to mention the album series and gauge her interest. She seemed to think it’d be a great idea, so it was easy moving forward from there. Lena: I'm secretly (not so secretly) a huge nerd and absolutely love the work that Jayson & Hibino-san have been doing with the Prescriptions for Sleep series. I'd been following the album releases pretty closely ever since the initial few, and thought how neat it was that they'd produced such soothing takes on all of the music I grew up listening to. It was a total surprise that Jayson reached out about doing a Celeste-centric album, especially since the only other single-game releases were for Secret of Mana and Undertale, which I considered to be a classic and runaway hit, respectfully. Even though Celeste had already been out for a month or two, I don't think I really considered the magnitude of its success until then. It was really humbling! This is the 7th Prescription for Sleep album with GENTLE LOVE. What has it been like to work with them? Jayson: I can’t believe we’ve done that many albums already! When I started thinking about a “lifestyle” album with music that would be for sleeping to, my mind immediately came to Norihiko Hibino, as his mission to heal people with his music aligned pretty closely to what I wanted to do. I’d been a fan of their solo recordings, had written about them extensively, and helped promote them over the years, so it was an easy choice. Hibino-san and AYAKI are both professionals, and the making of these albums is easier than anyone could probably imagine. I essentially send MP3 files of all the music along with recording notes to explain the context and moods associated with each track, and Hibino-san creates a note chart for each song and discusses with AYAKI before recording. Then, they record an entire album in a day. It’s thanks to their strong backgrounds in jazz that they’re able to improvise these albums so quickly. I was blown away the first time, but have come to expect the quick turnaround! What was the process for this album? How long did it take to come together? Who came up with the idea for the comic? Jayson: I kind of went over this before, but after our meeting at GDC, I kept in touch with Lena and discussed with her over the next month which songs to include, developing the recording notes for GENTLE LOVE, and having her poll her Twitter fans for the final track selection (their options were “First Steps,” “Scattered and Lost,” and “My Dearest Friends”). Once we recorded, I got her feedback every step of the way, from the music to the booklet contents to writing liner notes for the album. She was so involved with the entire process that she definitely earned her co-producer title on the album! We also got Matt Thorson, the developer of Celeste, to sign off on all the packaging contents as well. As to the timeline, after our March 2018 GDC meeting, the album was recorded in April. It took some time to get the masters back and work on all the packaging, promotional videos, and so on, but as you know, the album was announced at the beginning of October for a November 2 release date. The physical edition should start shipping before December. As for the comics, I was thinking about neat add-ins for our for our Prescription for Sleep: UNDERTALE album, which is the only other album in the series to get a physical edition, and loved Maximo Lorenzo’s comics from the Metroid arrangement album by The Bad Dudes. So I contacted Mustin, who masters Prescription for Sleep: Game Music Lullabies, and got put in touch with Maximo, who offers his own unique spin on the game universes he touches, injecting his own style and humor. I think they came out really well. Lena: I think Jayson summed it up pretty well! I don't think I have anything else to add. What was your role as co-producer? Did you help GENTLE LOVE with any of the arranging, production, or mastering? Lena: The majority of my role came from a general oversight and feedback throughout the whole process. Jayson did a great job keeping me in the loop every step of the process, and I assisted with putting together the initial notes for GENTLE LOVE. There were a number of context-specific things I wanted to make sure came across, like the emotional arc that Madeline goes through, or her relationship with her other self and how that develops over the course of the game. Favorite tracks on the album? Jayson: I think it’s not surprising that my favorite tracks are those that I loved best from the original soundtrack. “Heart of the Mountain” is my absolute favorite. It’s so thoughtful and determined. I think GENTLE LOVE captured the essence of the song perfectly. You can really hear them pour their heart and soul into the performance. It’s no wonder it was their favorite track as well. Also, “Quiet & Falling ~ In the Mirror” is up there, and I love that they were able to capture the magic of playing the song in reverse, just as with the OST. I think it worked out really well to split up the two sides of “Resurrections” as well, and it was fun having Lena name the two halves as sort of an official subtitle for them. Lena: Surprisingly, my favorite is also “Heart of the Mountain”! Jayson really championed this one, as it wasn't my first choice because it's less attached to the primary story arc of the game. For those that haven't played the game, The Core is a bit of an epilogue level that shows Madeline returning to the mountain after some time and attempting to get to the depths of its secrets. While there are no real answers, it is a unique track because I stepped away from Madeline's motif and tried to write a theme for the mountain itself. The true "Celeste Theme", in a way. I think it's a melody that really connected with the musicians, because they each interpret it in such a way that feels unique to them, and beautifully each time. Almost as if they're all approaching the mountain and showing us what moves them. Would you consider tackling a similar project in the future? Is there a particular style/genre that you would like to see the Celeste OST arranged for (e.g. metal, funk, ska)? Do you have any favorite covers and remixes right now? Lena: Absolutely! While I might be getting to the ends of what I'd like to support for Celeste itself (I need to focus on other projects eventually! ), I think this sort of arrangement album is amazing to really see how other musicians interpret something I made. It's very humbling every time a new remix pops up, and I actually have a YouTube playlist I've made with a number of my favorites! As far as another genre goes...I want to see a Celeste Eurobeat remix album called Initial C. This might be really silly, but ever since I joked about it I've wanted to see it happen! Don't let me down, internet. What has been the most important lesson that you’ve learned from producing these Prescription for Sleep albums? Jayson: I suppose the lesson I’ve learned is produce them for the right reason. You can’t get into game music with the mindset of making money. It’s hard to sell music in this era of market saturation and music streaming. So it’s really reinforced my mindset of this being a passion project. A few albums in the series haven’t performed as well as I would have liked, but that’s okay. At the end of the day if we can connect with people who really appreciate what we’re doing, and we don’t lose money, we can live with that. I’ve talked to Hibino-san about this many times, and he agrees 100%. Let the mission be helping as many people as we can with our music, and as long as we can do that, we can count what we’re doing as a success. It seems like the world of video game music is expanding all the time. What do you think is the most exciting prospect for VGM composers and remix/cover artists? Jayson: Expansion also means there’s a lot more noise out there. To continue what I was saying before, do whatever you’re doing for the right reasons. If you’re in this to make a buck, you’re likely going to be disappointed. You have to be passionate, and in this era of music streaming, you’re looking at a slow burn in terms of revenue as opposed to a quick influx of cash that was associated with physical/digital album sales in the past. I’d say it’s an exciting time as well, as there is increasing acceptance of game music into the mainstream, so it’s important now more than ever to approach things in a fresh and unique manner. Doing what I do in the marketing space for game music, it’s important to have that one-sentence tagline or elevator speech. For Prescription for Sleep: Game Music Lullabies, it’s, “Popular game music tracks arranged and performed live by Metal Gear Solid series composer Norihiko Hibino as jazzy lullabies to sleep and relax to.” Starting with that tagline to produce your music may not really be in the spirit of creativity and passion, but once you’ve created your art, I think it’s helpful to try to frame what you’ve done in this way. I hope this helps! Twelve years later, we're here, and more than ever I feel a sense of camaraderie among the younger group of composers working in not just games games, but animation, dance music, electronic releases. We're all here and helping each other out, and arranging each other's work. I think if the next generation and beyond continue the trend, it's only going to be more exciting to not just write game music but be involved in the continued life being breathed into modern music. Thank you Lena and Jayson for sharing your thoughts! Prescription for Sleep: Celeste releases November 2nd on all major digital platforms. You can preview the album or pre-order the physical edition on Bandcamp.